This year the weather could not have been any more perfect for a day outside at the Country Living Fair. Perfect cool temps after being so cold and windy last year. My sister met me and Laura at the fair and this was taken with Laura's phone right after we walked through the gate by a lady we had talked to briefly at the restroom. Shortly after we got there we made a bee line to the French Laundry Home booth where beautiful linens and pillows are sold at super prices. This was a bed on display there. This is the print on the duvet. The fair photos were taken with my phone and I only took a few. This is another view of the bed. All the linens are for sale. My other favorite booth is the one I hit up last year for a couple breadboards and a market basket. He had some great stuff again, but I ended up not purchasing anything from him this time. Here is a look at some of what came home with me. Two breadboards, two ironstone bowls and some Christmas things. I bought four of the white wreaths and eight of the green branches. The prices were very reasonable and I can't wait to use them this Christmas. My sister and I both loved the simplicity of this garland with tiny pine cones on it. My absolute favorite find is this red ticking pleated box pillow from French Laundry Home. It's a 20 x 20 with a luscious down insert and only $40. The rest of her pillows that aren't box shaped are $30 and lumbar shaped ones were $20. So that is my loot and if I had bottomless pockets I would have gotten more. If anyone in the area is going this weekend just beware that it is extremely crowded so be patient. Hope y'all have a fabulous Saturday! That looks like so much fun!! I would have been all over that garland. Great finds! The Country Living Fair is coming to my hometown in the spring, I am about to die I am so excited!!! It looks like you girls had THE PERFECT treasure hunting weather!! (& the breadboard guy, oh my goodness!!!) Glad y'all had a fun day! The stars were aligned for a perfect shopping adventure! Love the sweet white wreaths. Enjoy! Great pictures! I didn't see those bowls that you got. Wish I was there right now. I had so much fun yesterday. I love the bread boards and the French Laundry booth also...thanks for sharing. Fun Fun. Looks like you girls had great weather and a great time. Love the red ticking pillow you found. So sweeeet! Happy Week End. It was fun to see the Fair through both your eyes and Kelly's. You didn't buy much. I would have picked up some bread boards and spent a lot of time at the French Laundry shop. I saw your sister's post too. Someday...I keep saying that...I will have to go. Beautiful finds! I really love the bread boards you got. Thanks for sharing your trip with us! I would have wanted the same things! What a fun day. Great finds. I would have gotten a bread board too! next year we will have to get there when it opens. had a great time. see you next year. Looks like fun and I love what you bought! Thanks for sharing a peek. The white wreath caught my eye. I can't wait to see you Christmas décor! Great finds! I missed the fair this year, but had a blast last year. Enjoy your goodies! 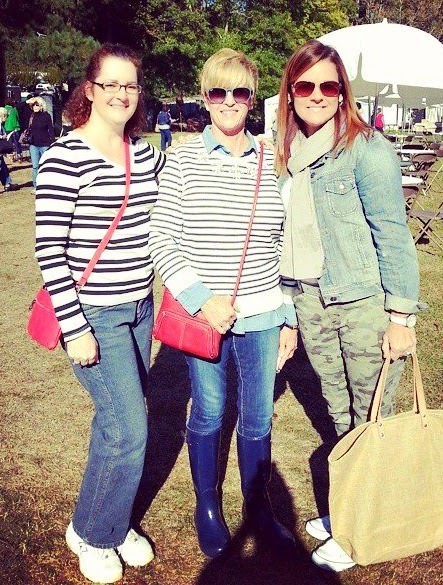 Love, love your finds....glad you three had a great time....hope to make it next year!! Looks like some really great finds and a really great haul that you made. Can't wait to see them in your home! I would love to do this next year! Do the vendors take checks and credit cards? cash only? What a beautiful photo of you all! Wow what fun....I see lots of great finds!